This chocolate cake recipe is one I always turn back to in times of need for a chocolate cake. It is reliable and, above all, tasty. We had just moved into a new home, so Michelle decided to make a home-coming cake. 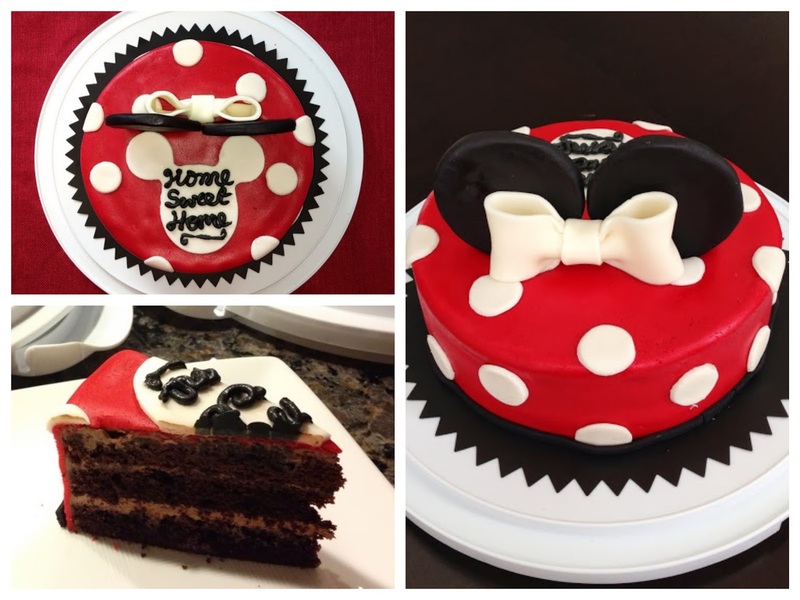 As a fan of Disney, having lived in Florida for a handful of years frequenting Disney World as often as possible, she decided it might be fun to create a cake inspired by Minnie Mouse. For the writing, we used left over frosting mixed with black food-colouring. The ears and spots were simply fondant circles. To get the ears to stay up, Michelle had to make them rather thick. The white bow can be made easily using a long, rectangular strip of fondant folded so that the ends meet in the centre. A smaller, rectangular strip was used to cinch the the centre to form a bow shape. This cake recipe was adapted from David Lebovitz' Devil’s Food Cake. 1. Grease two cake pans and line with parchment paper. 2. In a bowl, sift the cocoa powder, cake flour, salt, baking soda, and baking powder. 3. In a stand mixer, beat butter and sugar together for about 5 minutes until smooth and creamy. 4. One at a time, add the eggs, scraping down the sides of the bowl with each addition, beating until mixture is fully incorporated. 5. Mix together the coffee and milk. 6. With a spatula or wooden spoon, stir half of the dry ingredients into the butter mixture. 7. Add the coffee and milk. 8. Stir in the other half of the dry ingredients. 9. Divide the batter into the 3 prepared cake pans, place all 3 in the center rack and bake for 25-30 minutes in an oven preheated to 350ºF, or until it passes the toothpick test. I usually rotate the pans 3/4 way into total baking time. 10. Cool in the pan for 10 minutes. 11. Run a knife along the edges to release the cake from the sides of the pan. Invert it gently onto a cooling rack and allow to cool completely. 12. For the frosting, melt the chopped chocolate with the cream in a microwave safe bowl in 15 second spurts, stirring occasionally until melted. 13. Whisk the butter into the chocolate until completely melted and the ganache is smooth. 14. Cool until spreadable, which may take about 1 hour at room temperature. 17. Even out the tops of the cakes with a bread knife. 18. 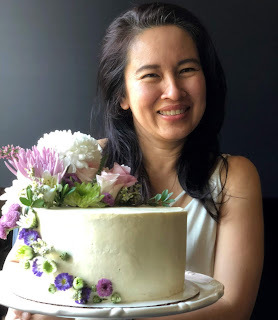 Place the tallest layer on a cake platter, making sure to save the smoothest cake bottom (when the parchment is removed) for the top most layer. 19. With a silicone brush, brush the cake top with the syrup. Allow time to soak in, about 2-3 minutes. 21. Repeat with the middle layer. 22. Last layer goes bottom side up. Empty rest of ganache frosting on the top and try to make the best of it.